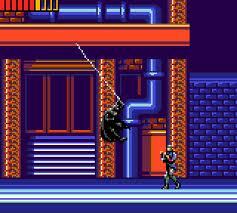 Batman Returns is an action-platformer that was ported to the Sega Master System in 1993. There's five stages and your job is to protect Gotham City against The Penguin and his evil creatures. Button 1 allows you to attack with Batarangs, while Button 2 fires a Grappling Hook so you can grab onto ledges and swing between platforms. Unlike the Master System version, pausing the game gives you the ability to switch between Long Range, Normal, Powerful and Special attacks at any time; it's a fantastic idea that aides player strategy. Another difference is the inclusion of a life-bar (e.g. no one-hit deaths) that, ideally, should cut down on frustrating moments; however, it's actually a detriment to the gameplay, as the stages are laughably short and feature heavily scaled-down versions of its console counterpart. This results in a much easier game that requires very little skill to beat, as you can pretty much sprint through each area with reckless abandon thanks to the generous life bar. It makes for a less satisfying experience, and while I love the ability to select either an Easy or Hard route prior to Stages 1-4, it makes little difference as the latter barely ups the challenge. Even the Grappling Hook is neutered due to the zoomed-in camera; this affects the level design as there aren't many opportunities to choose your path through each stage. You can't even manually swing while hooked onto a platform which takes away much of the exploration and excitement of finding secret areas. It's a real shame, as the promising and varied locales are hindered by dull level design. At least the graphics feature smooth animation and the gritty music perfectly encapsulates the game's dark atmosphere. Batman Returns is an average action-platformer that's deeply uninspired and a shell of the superior Master System version. The core mechanics are in place, but the lack of challenge, dreary level design and under-developed ideas make this a single play-through experience rather than something you'll want to return to. Random trivia: The Sega Game Gear also housed versions of The Adventures of Batman & Robin (1995) and Batman Forever (1995).